And by “iced crack” I mean cold-brewed coffee! Cold brew is all the rage right now, and for very good reason. For those of us who like their coffee very milky *raises hand*, it is an elixir from heaven. No joke, I can drink this stuff black with no sugar. 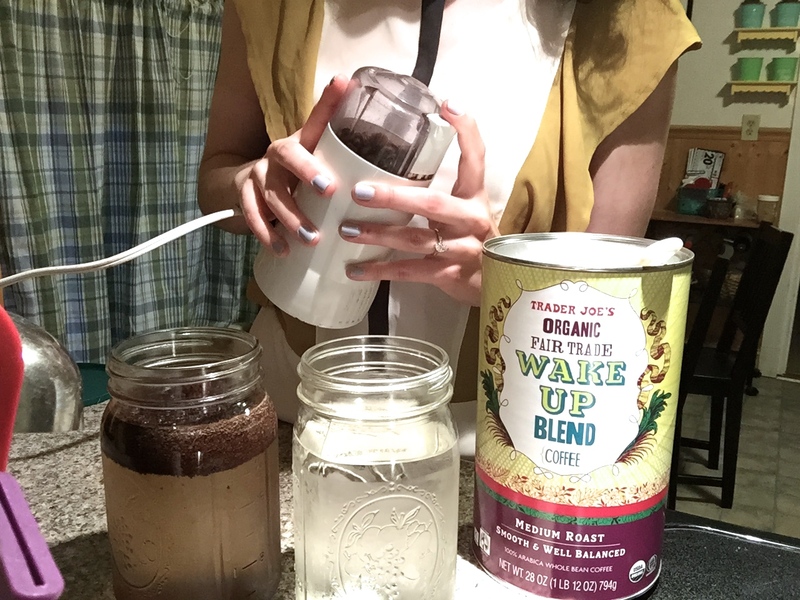 When I finally perfected making this, I drank so much of it I barely slept for a week. My fiancé says that I have ruined him for all other coffees. He calls it “Fig-proof”, as in, he can’t possibly screw it up, no matter what he does to it or puts in it. 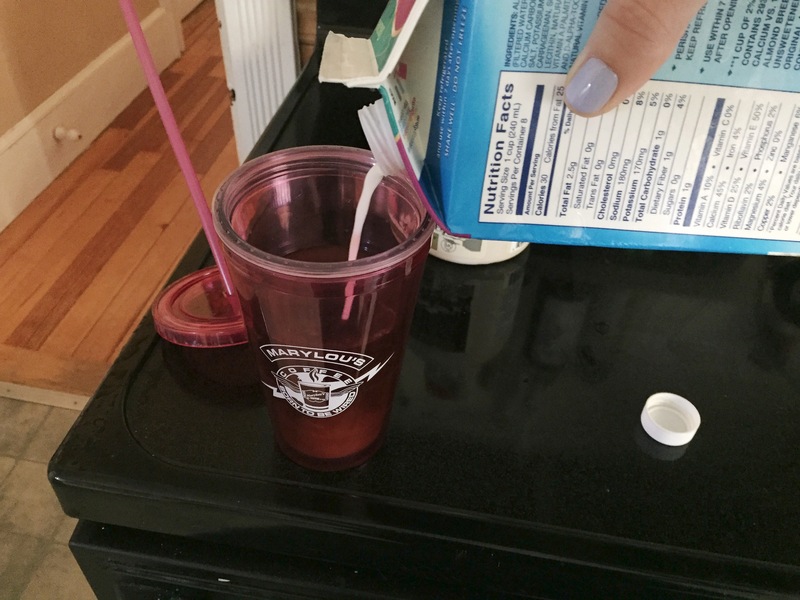 You can find recipes for cold brew anywhere on the internet (Pinterest is a lifesaver), but if you’re reading this and you haven’t yet tried to make this at home, DO IT and stop paying $3+ a cup to get it at Starbucks! 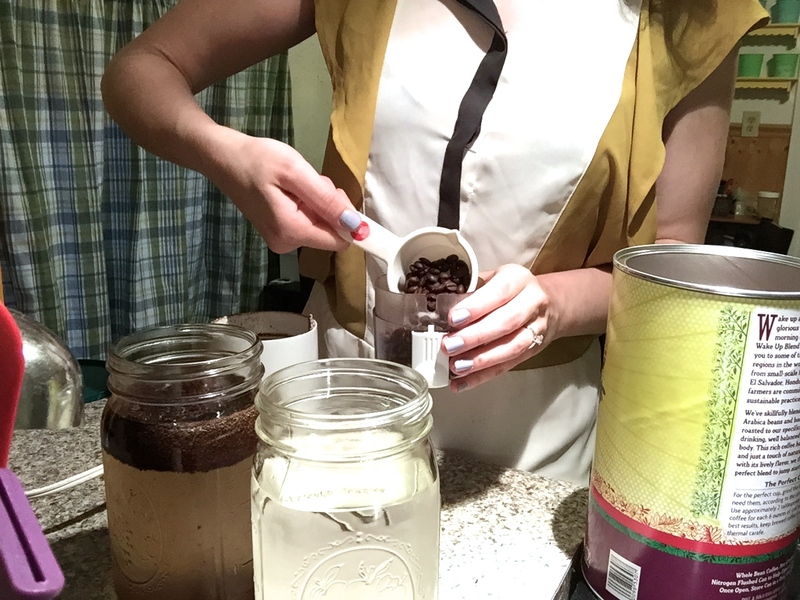 You’ll need whole bean coffee in your favorite blend, quart sized mason jars (or a gallon jug, whatever), and a coffee grinder. A funnel is optional, but encouraged. 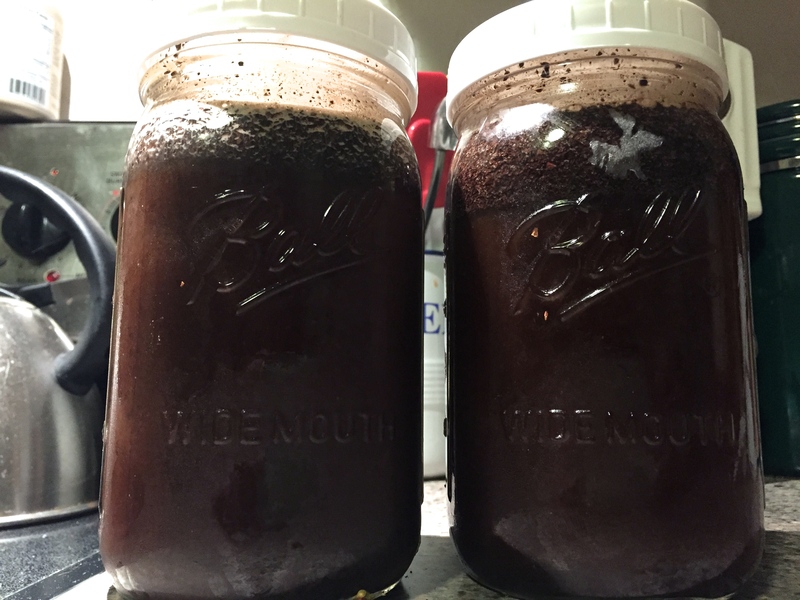 I like to buy my coffee in bulk, since I make this cold brew every 2-3 days. 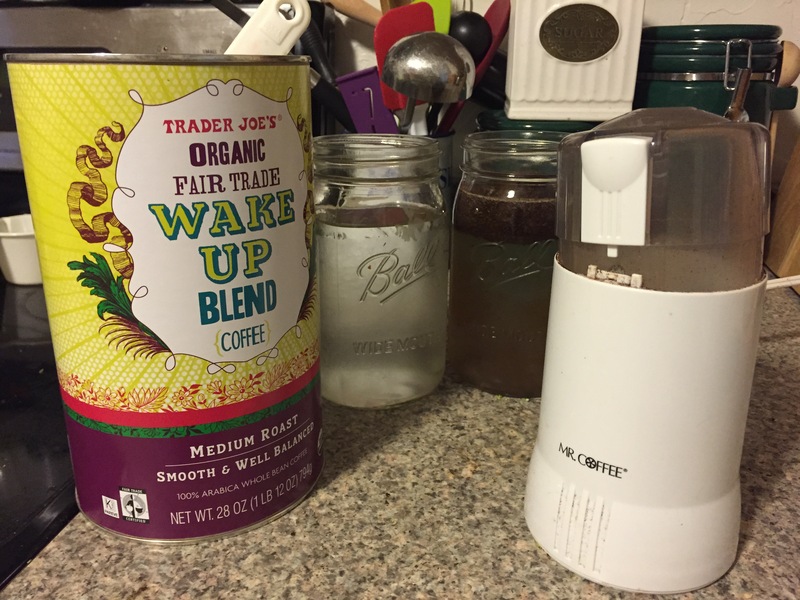 Trader Joe’s has a great selection of inexpensive, quality coffees. Costco is another great place to get bulk whole bean coffee in brands like Starbucks or Coffee Bean & Tea Leaf. 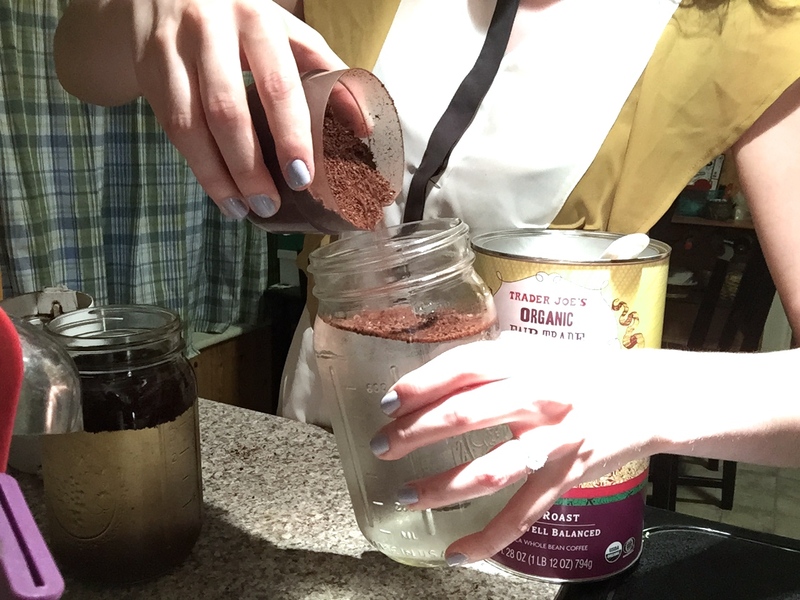 Grind your beans to a slightly coarser grind than you would for auto-drip coffee. Not as coarse as a French press, not as fine as espresso. Eyeball it. The golden cold brew ratio is 1 cup ground coffee to 4 cups cold, filtered water (or .25 cups coffee to 1 cup water if you’re making batches smaller than a quart). This might as well be printed in the Bible. You can go stronger, but you’ll just end up diluting your prepared drink more later. Measure your coffee, grind it up, and add it to your water. This is where the funnel comes in handy. I’ve wasted so much precious coffee by spilling it all over my counters. 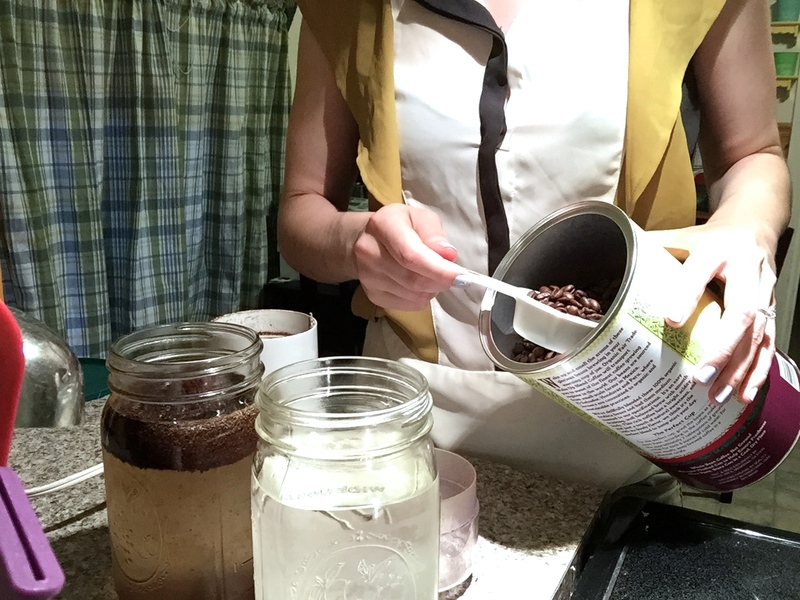 I like to use mason jars to steep my cold brew because they have measurements on the sides, and I’m all about reducing the amount of dishes used in any given meal prep. After you finagle the grounds into the jar, then comes the fun part. Screw on a lid (I like these Ball brand plastic storage caps as they don’t rust, are dishwasher safe, and come in wide-mouth and regular size) and shake it like a Polaroid picture or James Bond’s martini. Dance while you do it! Blouse is Zara via Buffalo Exchange. Let it sit for 12-24 hours. I usually make mine in the evenings and strain it before work in the morning. The straining is the tough part. This took me a while to perfect. Finally, I consulted the Pinterest oracle and learned that cheesecloth is the way to do it. I have heard that nut milk bags work beautifully. I place a mesh strainer, lined with a small piece of cheesecloth, over a 2qt or larger pitcher. I agitate the jars one last time so that the grounds don’t come out in one giant clump, and slowly pour it out through the strainer and into the pitcher. Another method, which I use semi-frequently, is to pour your cold brew and grounds into a French press and strain them that way. 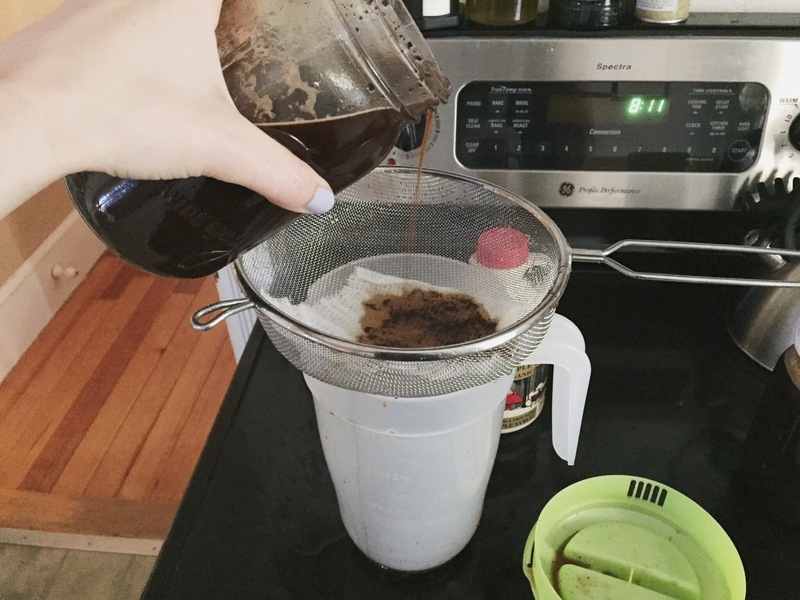 When I use this method, I still like to pour the coffee through the cheesecloth so that the finished product isn’t cloudy.There’s no way to completely avoid sediment in your cold brew, but it sinks to the bottom of the container so it doesn’t interfere with the overall coffee experience. As soon as the cold brew has been strained, it’s ready to drink! 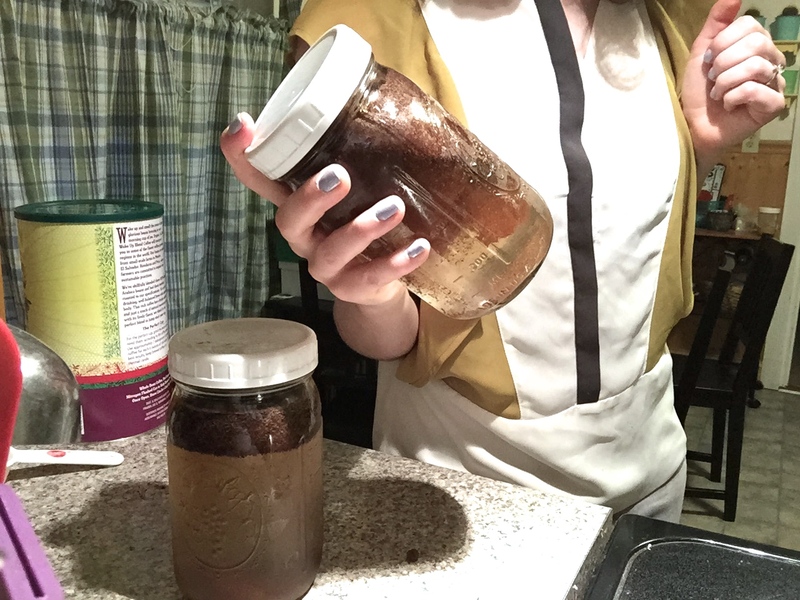 It will come out slightly stronger than regular iced coffee, so I recommend diluting it slightly with filtered water. 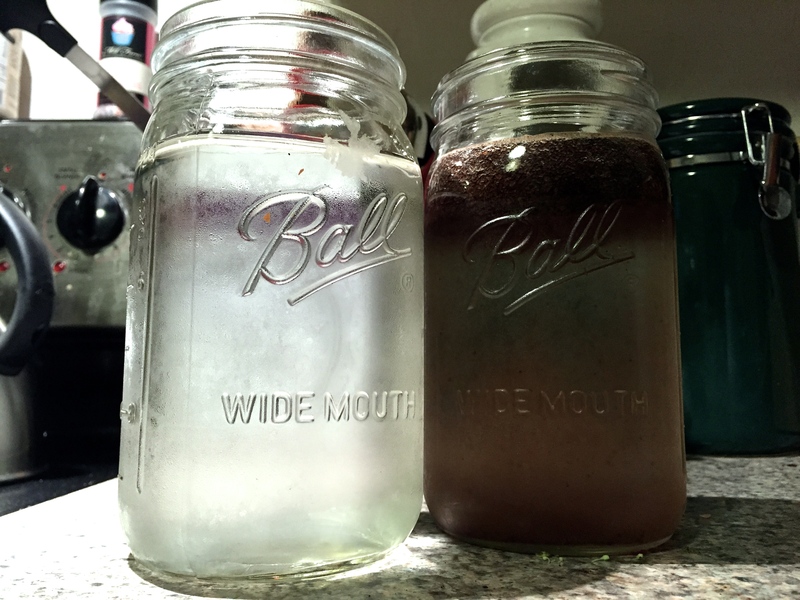 Most sites say a 2:1 coffee to water ratio, but I use slightly less water, as my coffee only steeps for 12 hours and I take it with ice, which dilutes the mixture over time. Apart from the dilution, prepare your cup exactly as you would any other cup of coffee. My absolute favorite way to take it is with unsweetened almond milk and all-natural maple syrup for a touch of sweetness. All of the almond milk, all the time. Currently enjoying my cold brew on break at work with some Trader Joe’s goodies.